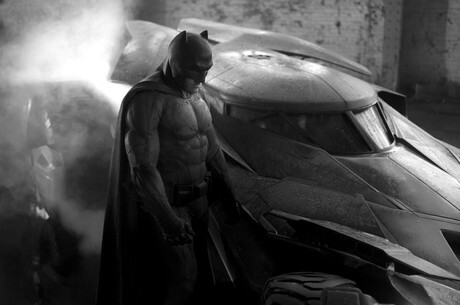 New Details on Ben Affleck's Batman in DAWN OF JUSTICE! It’s looking like Ben Affleck’s Batman in BATMAN V SUPERMAN: DAWN OF JUSTICE is shaping up to be a decidedly different take on the classic character. In what would seem to be an attempt to distance the property from Christopher Nolan’s Batman, Snyder’s film will see a much older, more seasoned Caped Crusader. According to Devin Faraci at Badass Digest, when DAWN OF JUSTICE opens, Batman will have been patrolling the streets of Gotham for close to 30 years, and will still be little more than an underworld nightmare. There are stories and rumors, but he does his work under cover of darkness and is certainly not out in the open. He’s never even really been photographed. So for the people of Gotham, he is little more than a fantasy. Some recent photos emerged from the set, revealing Affleck as an older version of Bruce Wayne, complete with greying temples. You can check them out over at Collider. It’s an interesting direction to go in, and one that absolutely sets itself apart from the iterations of Batman that we have gotten used to seeing on film. And given that Nolan’s trilogy only concluded in 2012, it’s comforting to see that Snyder is working to make the character his, and not just ride the coattails of what came before. It sounds like he’s trying to give this Batman his own unique feel and story. The article also briefly states that Wonder Woman (Gal Gadot) is also not a new addition to the MAN OF STEEL universe. She has been operating for quite some time as well, but like Batman, under the radar. So we won’t have a complete origin story on that front either, when the group meets up in DAWN OF JUSTICE. What do you guys think? Are you excited to see a different take on Batman? How do you feel about him being a more subdued character? Do you think it lends itself well to the concept? What do you think of the photos of Affleck as an older Bruce Wayne?